Republican presidential candidate and Texas Sen. Ted Cruz is supporting his Senate colleagues' vow to block the confirmation of U.S. Circuit Court Judge Merrick Garland to the Supreme Court -- and taking a shot at rival Donald Trump while he's at it. 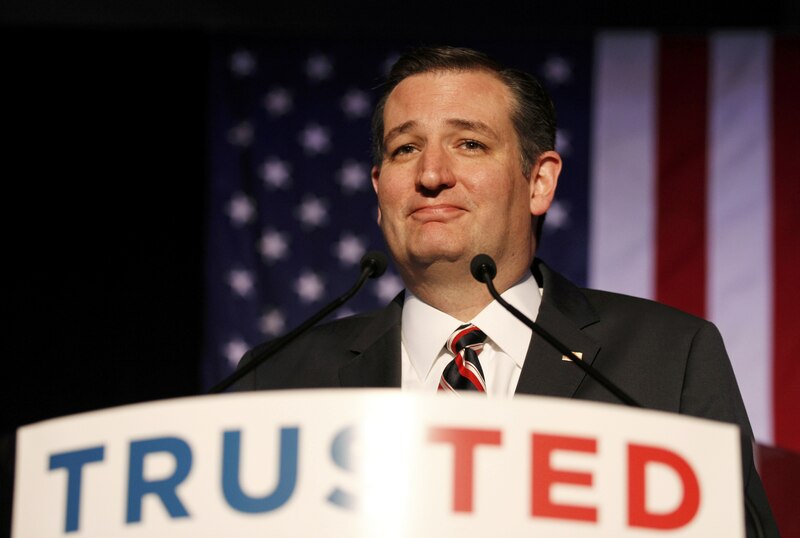 "Merrick Garland is exactly the type of Supreme Court nominee you get when you make deals in Washington D.C.," Cruz said in a statement Wednesday. "A so-called 'moderate' Democrat nominee is precisely the kind of deal that Donald Trump has told us he would make -- someone who would rule along with other liberals on the bench like Justices Ginsburg and Sotomayor." Garland, who has been hailed by both sides of the aisle as a qualified and objective judge, is facing a tough slog to confirmation. Several prominent Republican lawmakers repeated their pledge Wednesday that they would not consider any Obama-appointed nominee -- despite their positive feelings about Garland himself. Even Arizona Sen. Jeff Flake, who serves on the Senate Judiciary Committee and has broken with his GOP colleagues in agreeing to meet with the nominee, said he had heard "nothing but good" about Garland. Still, Flake told "CBS This Morning" that he would only be open to voting on the nominee after the November election, during the president's lame-duck term. Cruz applauded his fellow senators in his own statement. "I proudly stand with my Republican colleagues in our shared belief - our advice and consent - that we should not vote on any nominee until the next president is sworn into office," he said. "The People will decide. I commend Mitch McConnell and Chuck Grassley for holding the line and ensuring that We the People get to exercise our authority to decide the direction of the Supreme Court and the Bill of Rights." Ohio Gov. John Kasich, meanwhile, hasn't exactly given his full-throated support for Senate Republicans' plans to block Garland. But he did lament the president's appointment of Garland, telling supporters at an event in Villanova, Pennsylvania that the pick has only created "more division." "What I felt should have happened -- I don't think the president should have sent anybody up now," Kasich said Wednesday. "Because it's not going to happen. It's just more division. Now we have more fighting, more fighting, more fighting." He added that Republicans also had a share in the blame. "If I think I'm going to blow something up by sending something in the seventh year, I wouldn't do it," Kasich added. "I think this is not good for our country. It's a roving debate. Both sides, you know, hands are guilty. That's where we are." As of Thursday morning, Trump had yet to comment on Garland's nomination. Democrats, in contrast, had only praise for the former federal prosecutor, who front-runner Hillary Clinton called "a brilliant legal mind" and Bernie Sanders deemed "a strong nominee." "Today, in announcing Judge Merrick Garland as his nominee, President Obama has met his responsibility," Clinton said in a statement Wednesday. "He has chosen a nominee with considerable experience on the bench and in public service, a brilliant legal mind, and a long history of bipartisan support and admiration. Now, it's up to members of the Senate to meet their own, and perform the Constitutional duty they swore to undertake." Clinton noted that the Senate has never taken more than 125 days to confirm a justice. "This Senate has almost a full year to consider and confirm Judge Garland," she added. "It should begin that work immediately by giving Judge Garland a full and fair hearing followed by a vote. That is what the American people deserve, it is what our Constitution demands, and with millions of people's lives in the balance, anything less is entirely unacceptable." "My Republican colleagues have called Judge Garland a 'consensus nominee' and said that there is 'no question' he could be confirmed," Sanders said in a statement the day the president announced his choice. "Refusing to hold hearings on the president's nominee would be unprecedented. President Obama has done his job. It's time for Republicans to do theirs."